For years I shunned bright colours in my garden. The only orange flowered plants I kept from the original garden layout were the Hemerocallis fulva Kwanso featured in an earlier post. Any red flowers were all dark reds, they veered towards the blue spectrum with no hint of orange allowed. Then suddenly, in my autumn years, I realized that I was enjoying other gardeners borders full of brightly coloured late flowerers as much as my own pastel drifts of asters, anemones and phlox. Out came the spade and the Hot Flush bed started to evolve. 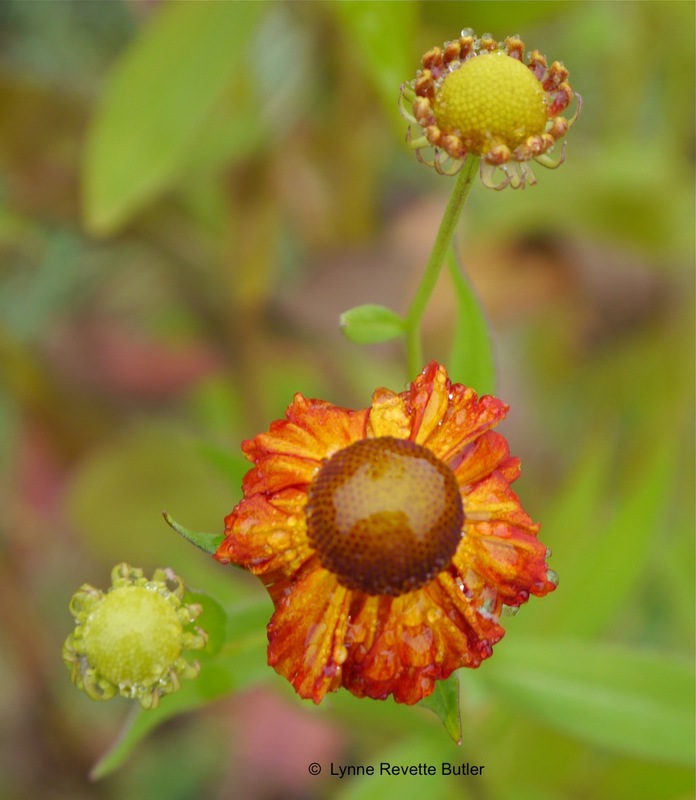 This summer I added Helenium Septemberfuchs….. This entry was posted in Gardening, lifestyle and tagged crocosmia carmine brilliant, helenium septemberfuchs, hot borders. Bookmark the permalink. Beautiful, Lynne! Love the vibrant colors! They certainly lift the spirits as the days grow shorter. Thank you Elizabeth, they make me feel happy when I look at them. Thank you, glad you enjoyed it. 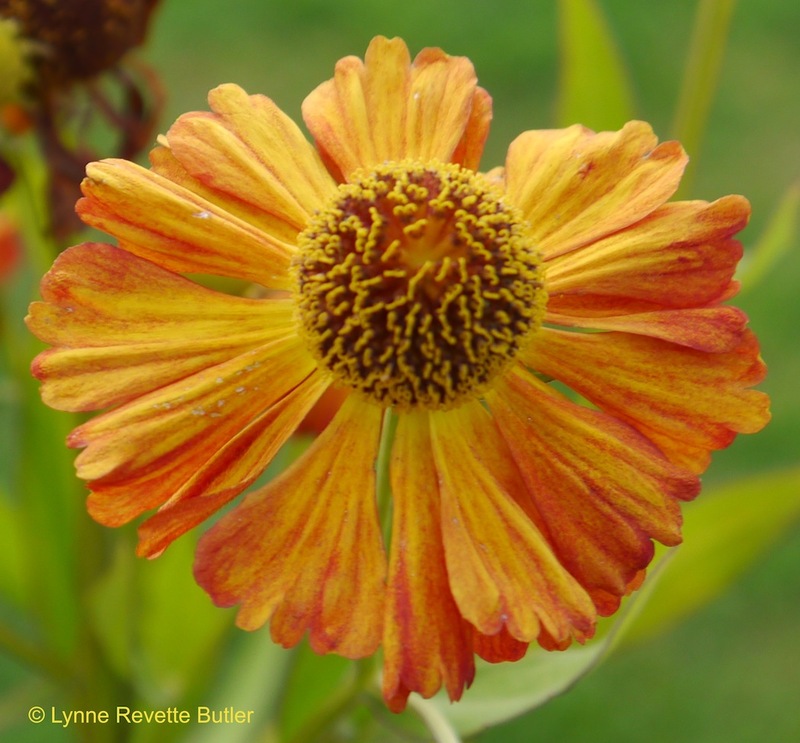 Do you have a favourite orange flowered plant? I too have learned to love these colours – they look good in autumn light alongside grasses. Lovely choices and lovely photos! Very nice combination: Helenium and Crocosmia. It never would have occurred to me. They came from different suppliers but were muddled together in the trailer in flower when I set out to plant them and I liked the effect. I’m hoping that dividing/ removing old corms once every three years will keep them both happy otherwise I’ll split them out into separate drifts. 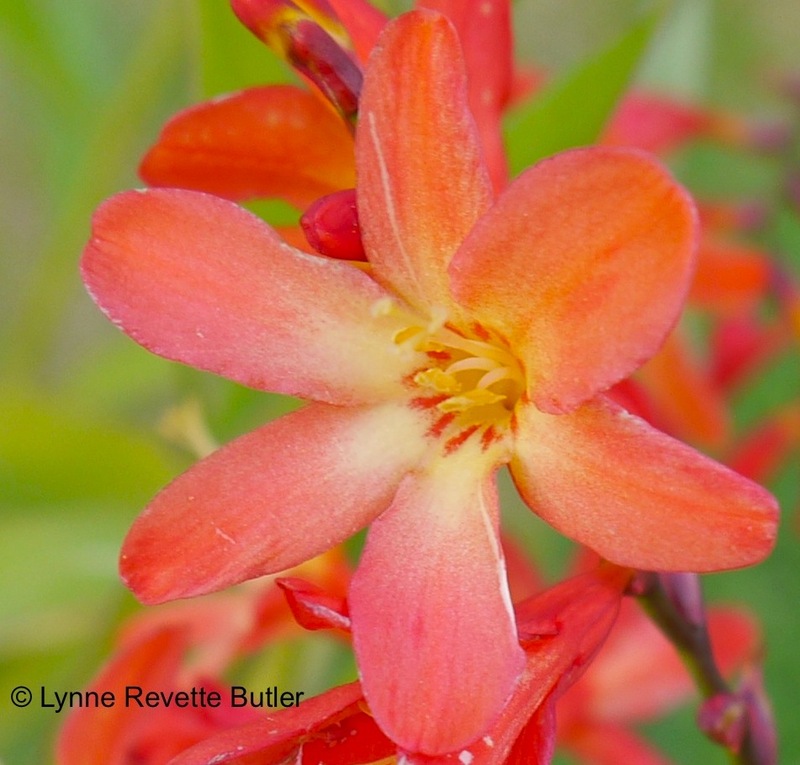 Yes, you do have to keep after the Crocosmia. Those clumps just keep getting thicker and thicker. I’ve read about you fiery North Devon ladies! I would love to add a ginger plant to the mix and the “Tara” you featured on your blog looks perfect but I think it might struggle here overwinter even under a good mulch. Hedychium Assam Orange seems to be much tougher and comes very easily from seed. We have seedlings here that you would be welcome to if you were closer, but I will look for some seed for you. Thank you Gill, that is very kind and much appreciated. ps It is all true about us ND ladies! For the last 2or3 years I have added orange to the garden with (I think )great success…It adds a zing to lots of areas like purple beds ,etc.walk round with an orange flower and try to get the feel..works wonders..
I’m looking forward to seeing more photographs of your garden soon, hopefully showing some of the orange plants. At the moment I am concentrating on improving the hot area with its reds, oranges, and bright yellows plus a few “acid” tones but I may expand my use of them when I start dividing the plants. I do agree that wandering round with a flower produces some great results, especially now we have digital photography and it’s easy to take shots to remind you of possible new plant combinations. I’ve been in this garden for 35 years ,when I first started to garden it was while the children were small so I had to accommodate them and all their toys and pets.Planting was very much a see it and buy it regardless of colour or even knowledge of the plant .But the years pass and for me the colour and texture has taken over.I think it’s the textile connection.But it’s never just so,we are,as gardeners always seeking perfection,in my case never happy unless I’m redoing an area.Good luck with your oranges. I came here in the late sixties when I married and my story is very much the same as yours although my mother was a keen gardener and I had learnt a fair bit from her so knew how to choose low-maintenance plants. Back then I wore bright orange clothes, had orange gloss paint on several of the doors and used some amazing Habitat fabric (orange & chocolate brown) to make a pair of curtains. I don’t think there is any possibility that I will go back to decorating my house in orange but I wish I had tried it in the garden much sooner. I never understand it when people tell me they have “finished their garden,” mine is a WIP, just like my novel, although I am determined to finish revising that over the winter. good luck with everything…my daughter and her husband have a house full of 70’s ‘stuff’ it’s like a time warp …but quite interesting …but also one I definitely could not live with…by the way just bought a pack of orange wallflowers….mmmm now where shall I put those…? So lovely this time of year! I agree. Which are your favourite plants for “Fall” in your area? Perhaps I should be asking which plants are the ducks favourites! Just posted one today–autumn crocus! Also, the hydrangeas finish up their long season by fading into softer but still lovely colors. Our sedum keep the bees buzzing as well. Unfortunately, the ducks like those, too!!! And I have “liked” it. I love sedum; we have some larger ones like Meteor but I think my favourite is the much lower growing Bertram Anderson. Orange is just so sassy! That’s why I love it! And it doesn’t matter what the flower is. Tulips, red hot pokers, portulaca, zinnias, nasturtiums, marigolds, you name it, I believe I have an urgent need for it! I like the really dark marigolds; I had used them for companion planting with the greenhouse tomatoes for the past 30 years and now grow extra to plant out. My favourite kniphofia is “Tawny King” do you have any favourites from your list?